Conneaut Lake Park is a destination that has created family memories for generations of western Pennsylvanians. The park grew as a railroad park, built as a getaway for Pittsburghers and others to get away for a while. The park was a resort where people would go and spend a week to get away. As the dawn of the automobile age came along, the park became a popular blue collar destination that even brought in honeymooners and vacation cottage owners. 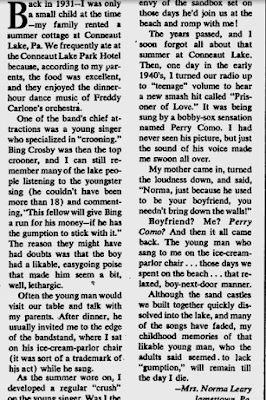 The park was even the place where famous singer, Perry Como, got his start. By day, he worked as a barber in a summer job at the park and by night he would sing. 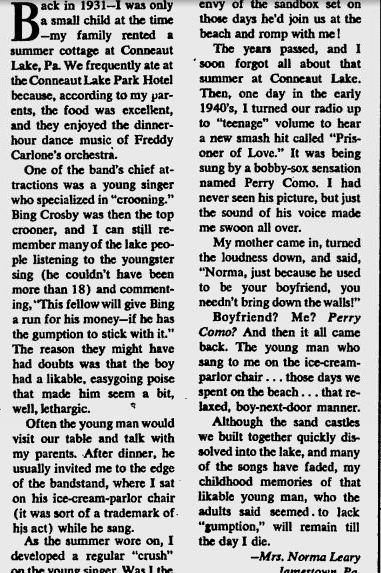 Perry Como got his start right at Conneaut Lake Park. Additionally, Doris Day played in her big band at the park when she was 18 years old, before she became the legendary superstar that we know today. The park fell upon hard times towards the end of the 20th century, and closed for a period of time. The park was able to eventually reopen and continually be improved against tough odds. The fruits of this labor are really showing through at the park, with more rides open and the water park area reopened this season. In my opinion, this place is the crown jewel of Crawford County. It is a park with multiple last of their kind and rare rides, in addition to lots of natural and historical beauty. Conneaut Lake, Pennsylvania's largest natural lake, is a huge draw for the park. There is a nice swimming beach, in addition to boating on the lake. There is no horsepower limit on this natural lake, drawing boaters from far and wide to have fun out on the lake. We started this visit with some swimming at the lake. We then played some midway games. In this one, I won the race, though the spoils went to Brit. The park's carousel is a stunning machine, dating back more than a century. It is one of the oldest carousels in existence, in addition to the only one remaining that was produced by the T.M. Harton Company. Harton should be well known to Pittsburghers, for he founded the beloved and lost West View Park that was located in suburban Pittsburgh. This carousel is one of the last things that remains that Harton had involvement in. Something about this carousel really captures me. We ride it every time we visit the park. The Devil's Den is a Pretzel produced dark ride, one of the few remaining gravity fed rides of its type. Coaster geeks argue about whether this should be considered a roller coaster or not, but it does have a chain lift and slight drop. Either way, this ride has some nice tricks and is a ton of fun riding in complete darkness. I volunteered and helped rehabilitate this ride a few years back. The biggest draw to the park is the Blue Streak wooden roller coaster. It was built in 1937 and is one of only two remaining coasters built by Ed Vettel. It also has one of the few remaining National Amusement Device (NAD) coaster trains. The result of these designs is a coaster that has extreme airtime, especially in the backseat. If you love a high adrenaline thrill, Blue Streak is a must-ride. This coaster has also been a work of love for park operations manager, Lenny Adams. He has dedicated his life to working on this ride for many years. His efforts have continually improved this classic, along with the rest of this fine park. This year's work has included a rebuild of substantial sections of track. Lenny was able to get the train ride operating this year after lots of hard work. This ride takes you deep into the woods surrounding Blue Streak. As I've mentioned before, a huge draw to this park is the natural beauty. The area around Blue Streak is exceptionally beautiful, with huge and old trees that could easily be first growth. The coaster is 78 feet tall. The trees surrounding the ride have at least 30 feet in height over the coaster. These trees are massive, and some of the finest that I've seen. The minimal banking in the turnaround makes for a thrilling and awesome ride. And the Tumblebug! This is a fantastic ride that is one of only two remaining of its kind. It was made by Traver Engineering, a company that was once located in Beaver Falls. Tumblebugs were once mainstays at amusement parks, but only two remain, including this awesome ride. This is a speedy ride that offers a thrilling ride. After a lots of hard work, the waterpark area is now reopening. In addition to all of these rides, the park also has a great section of rides for the little ones. The historic Hotel Conneaut is a fun and affordable place to spend the night for a fun and relaxing time. The nightly rates start at only 45 dollars. Conneaut Lake Park is a must-see for anyone who enjoys natural beauty, history, swimming, boating, thrills, and affordable fun. The beach is free and all day ride wristbands that never exceed ten dollars a person. Took the family there last weekend and had a GREAT time! 1 day at the park, 1 day at the beach and lazy river, and 2 nights at the hotel...all for about $155 total! You can't beat that! Was this 155.00 per person or family?? Per family! Love this park- you can't beat the prices!